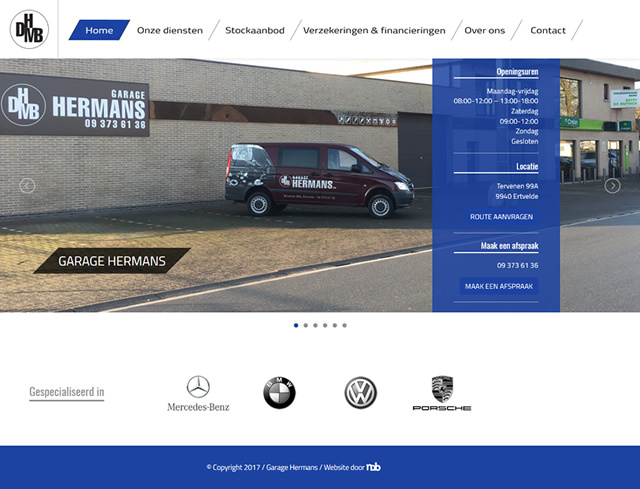 Garage Hermans is a small, family business with more than 30 years experience. It’s a specialized car workshop which sells new and used cars, focused on Mercedes, BMW, Volkswagen and Porsche. Their existing website was firmly obsolete in terms of layout and design, as well as content. Furthermore, little useful information was available on the website. The stock offer of used cars was loaded from an external website. For the new website, we not only developed a completely new, fresh and modern look, but we also addressed the content: more useful information for customers and visitors, and more insight into the history and operation of the business. The list of available cars is now also seamlessly integrated into the website.